About 43 miles with 3,782 feet of ascent and 2,093 feet of climbing. Some of the finest Cabernet Sauvignon grapes of the Napa Valley AVA are grown off of these roads. 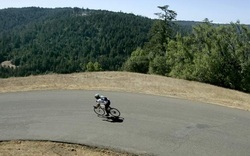 One of the most beautiful rides in the West Coast, but at 30 miles round trip from Occidental, including the steep climbs of Coleman Valley Road, it’s not for beginners. Exceptional cool climate Pinot Noir and Chardonnay come from the vineyards just off of these roads. 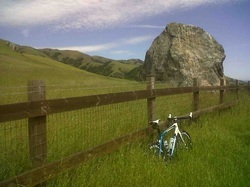 One of our favorite rides in Marin County, with over 60 miles of beautiful, rolling coastal hills, 2,700 feet of climbing (but a maximum elevation of only 757 feet) and peppered with cool climate Pinot Noir and Chardonnay vineyards.